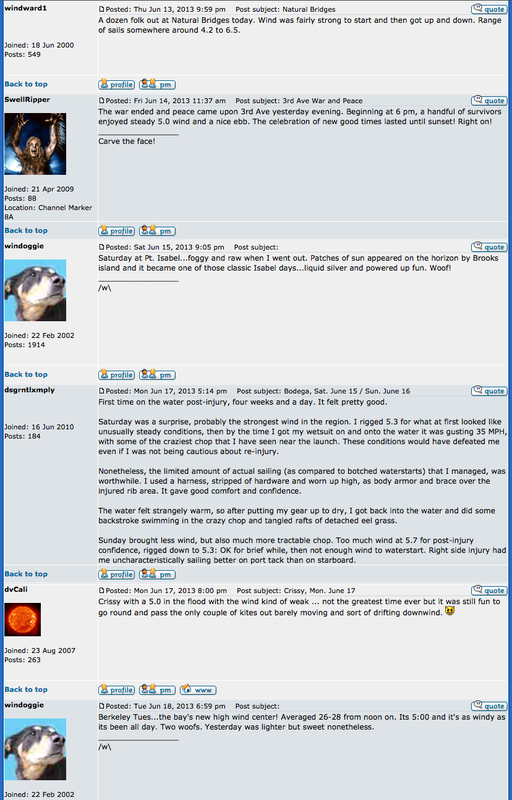 The last session reports on the old thread are included here as an attachment. Leave the old one up for awhile. Be fun to explore the novela. Definitely. It is awesome, will never be deleted, and will be kept as a Sticky for a long time. San Leandro for the first time this year. Very windy. Very crowded, I think at least 3 other sailors had been out throughout the day. 4.7 then 4.5 then could have done 4.0 but didn't. Tricky launching and returning when it's that windy. Those wanting to try the ocean could look far and wide for a better entry point and find that this is just one of the best! We have had a lot of sailors this year as the wind has been fabulous and it is attracting sailors like bees to nectar. Come join the growing hive and have fun sailing turquoise water instead of brown. Wadell 4.7 a little bumpy on low tide. Smoothing out some as the tide came in . It looked like its beach was doable today . i always thought r&g was sailable on a lower tide than bullhead. wind is better and earlier at bullhead. Hit R&G on Thursday, late around 5. John was out on a 4.5, pretty powered, but the wind lulled some and we rigged 4.7's and 4.9's. Nice sesh till 6:30, just 20% OP'd, maybe 30% underpowered, on a 80 liter wide board. Gusty/holey for sure, and a chess game for where the wind would be, but easy 4.7 and 80 liter board for me. Jumped till I got stomach cramps (abs), had to stand in the middle of the bay for 2 minutes to recover. Yogi on his 9 meter kite, Boggy on 5.3, and one other guy going out at 7 on a 5.3.